The first cable laid in Australian waters was in 1859, the route being across the Bass Strait from Cape Otway, Victoria, to Georgetown, Tasmania, via King Island, Three Hummock Island and Stanley Head. Henley’s Telegraph Works manufactured the cable and laid it using a chartered vessel, Omes. Tthe cable suffered from chafing due to the shoals and rocks on the sea bed around King Island, as well as damage from ships anchors/ The first fault occurred only three weeks after the cable was brought into use, and it was finally abandoned on 24 January 1861. Henley’s also manufactured the next cable, this time as a subcontractor for the Telegraph Construction and Maintenance Company Ltd., which in 1869 laid a cable between Tasmania and Victoria using CS Investigator. Siemens Bros laid two cables in 1909 using CS Faraday (1); this time they ran from Flinders, Victoria, to Port Dalrymple, Tasmania. The first telephone cable laid across the Strait was in 1935 when Siemens Bros. used CS Faraday(2) to do the work. After completing this they fitted out an old hulk with cable gear and laid a 11 nm telephone cable from near Fremantle to Rottnest Island. 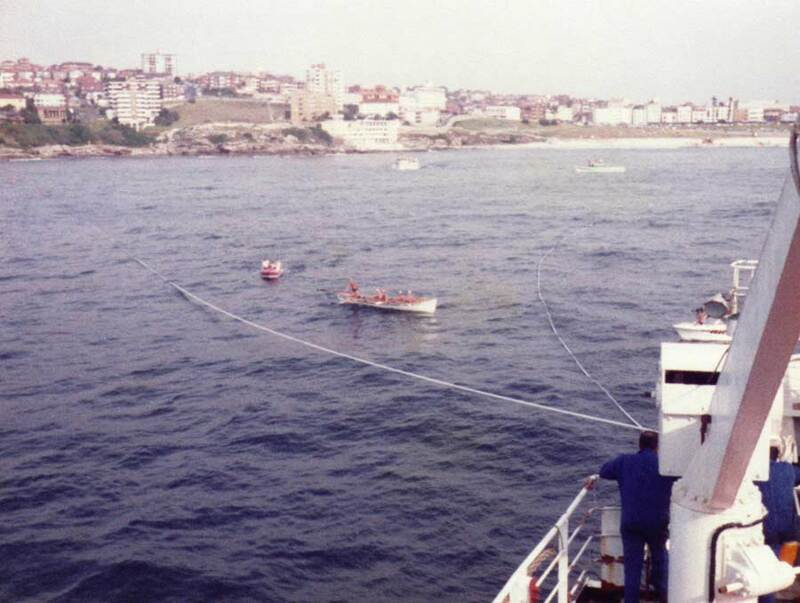 Maintenance was usually carried out by Eastern Extension ships and their successors. On occasions the NZ ship Matai was chartered and if none of these were available Mernoo was chartered on a temporary basis. To complete the link between England and Australia John Pender formed the British-Australian Telegraph Company. The first stage was to lay a 557 nm cable from Singapore to Batavia on the island of Java, CS Hibernia laying the cable in 1870. In the following year CS’s Hibernia, Edinburgh and Investigator arrived at Port Darwin, as it was known then, on 25 October. The shore end was laid on the morning of 7 November and the fleet set out for Banjoewangie, Java, arriving there on 16 November after laying 1082 nm of cable. The cable failed on 24 June 1872 and was not repaired until 21 October. Batavia and Banjoewangie, situated on either end of the island of Java, were connected by landline. The British-Australian Telegraph Company became part of the Eastern Extension, Australasia and China Telegraph Company (EEACTC) on its formation in 1873. In 1879 another cable was laid: Singapore - Banjoewangie by CS’s Scotia and Edinburgh, and Banjoewangie - Darwin, laid by CS’s Seine and Edinburgh, thus cutting out the Java landline. A third cable from Banjoewangie to Australia was laid by CS Seine in 1889 this landing being at Broome, Western Australia. With the formation of the Pacific Cable Board the Eastern and the Eastern Extension decided to extend their England - South Africa cables to Australia, the route being Cape Town - Durban by landline, then by cable to Mauritius - Rodriguez Island - Cocos (Keeling) Islands - Cottesloe, Perth - Glenelg, Adelaide. The Eastern Telegraph Company owned and operated the Durban - Mauritius cable and the Eastern Extension the rest. 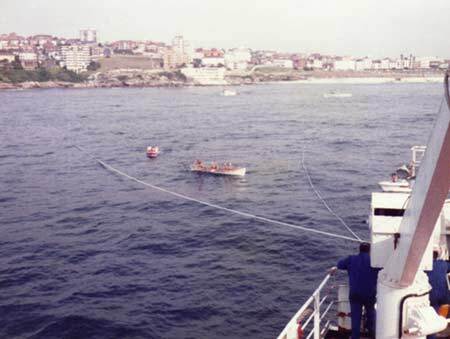 The next cable to land in Australia was laid in 1926 by CS Colonia from Cocos (Keeling) Islands to Cottesloe, Perth, this being a loaded cable. Following decisions taken at the Commonwealth Telecommunications Conference in London in 1945, the Australian Government purchased the assets of Cable and Wireless in 1946 and set up the Overseas Telecommunications Commission (OTC) to operate all external cable and wireless services. For COMPAC a link from Sydney to Auckland was laid by HMTS Monarch (4) with CS Retriever(5) laying the shore ends in April 1962. The SEACOM 2 route was Hong Kong - Guam - Medang - Cairns, Australia and provided links to TPC 1 at Guam and COMPAC at Sydney, the link between Sydney and Cairns being provided by microwave. Laying of SEACOM was carried out by HMTS Monarch (4) and CS Mercury. The cable and repeaters were manufactured by Standard Telephone & Cables Ltd and Submarine Cables Ltd.
Sydney, Australia, from CS Mercury, January 1983. ANZCAN, laid in 1983-4, was a replacement for COMPAC and covered the same route but with landings at Norfolk Island, one from Auckland and one from Sydney. The main cable, laid by CS Cable Venture, ran from Sydney to Norfolk Island, Suva, Fiji, Oahu, Hawaii and on to Port Alberni, Vancouver. Built in 1926 by Swan, Hunter and Wigham Richardson. Length 285.3 ft. Breadth 42.7 ft Depth 20.4 ft Gross tonnage 2417. First chartered in 1937 to carry out repairs. Fitted out with bow sheaves and a portable combined paying out-picking up machine and other gear. Also used for harbour defence work during World War 2. Site visitor Dr Paul Weaver has recently made observations about artifacts exposed by storms at the Cottesloe Cable Station site, near Fremantle Western Australia. Paul has the story and photographs on his Live Journal. This article gives further details of the Australasian cable network at the end of the 19th century. Australasia is in telegraphic communication with Europe and the rest of the world by means of three cables connecting with the various Asiatic continental lines. The first of these cables, which were all laid by the Eastern Extension Telegraph Company, Limited, was opened in October, 1872, joining Port Darwin to Banjowangie, in Java, whence communication is provided with Europe by way of Batavia, Singapore, Madras, and Bombay. In 1879 a duplicate cable was laid down, the colonies of New South Wales, Victoria, South Australia, Western Australia, and Tasmania agreeing to pay the company a subsidy of £32,400 per annum for a period of 20 years, the amount to be apportioned between the colonies on the basis of population. At Port Darwin the cables connect with an overland wire, which extends to Adelaide, a distance of 1,971 miles, and to construct which cost the South Australian Government about half a million sterling. The total length of line between Adelaide and London is 12,570 miles, of which 9,146 miles are submarine cable, and 3,424 miles overland wire. The third cable was laid in 1888 from Broome, in Roebuck Bay, Western Australia, to Banjowangie. The length of line by this route from Perth to London is 12,296 miles, 10,811 being cable and 1,485 land wire. The eastern colonies are connected with Broome by a line running from Adelaide, via Port Augusta, Eucla, and Albany, to Perth. The cable joining Tasmania to the continent of Australia was laid in 1869, the length being about 170 miles. It starts from the township of Flinders, near Cape Schanck, in Victoria, and terminates at Low Head, at the mouth of the Tamar, in Tasmania. This line is subsidised to the extent of £4,200 yearly by the colonies of New South Wales, Victoria, South Australia, Western Australia, and Tasmania, the contributions being based on the population figures. New Zealand was joined to the continent by a cable laid in 1876, the length being about 1,191 miles. The line has its Australian terminus within sight of the spot where Captain Cook landed on the shores of Botany Bay, and within a stone's throw of the monument of La Perouse. The New Zealand terminus of the cable is at Wakapuaka, near Nelson, on the Middle or South Island, whence another cable, 109 miles in length, is laid to Wanganui, in the North Island, with an alternate line from White's Bay across Cook Strait to Wellington. For the first ten years after opening the New Zealand cable was subsidised by the Governments of New South Wales and New Zealand, their annual contributions being £2,500 and £7,500 respectively, but no subsidy has been payable since 1886. A cable connecting New Caledonia with Queensland at Bundaberg was opened in October, 1893. It was constructed by a French company, and is guaranteed by the French Government to the extent of £8,000, and by the colonies of New South Wales and Queensland to the amount of £2,000 each annually for a period of thirty years, in return for which these two Australian Governments are entitled to use the cable for the transmission of official messages up to the amount of the guarantee. During the year 1890 the colonies opened negotiations with the Eastern Extension Telegraph Company for a reduction in the cable rates to Europe, which at that time were 9s. 4d. per word for ordinary messages and 2s. 8d. per word for press messages sent from New South Wales; and at a conference of the postal and telegraphic authorities a proposal to reduce the tariff to 4s. per word for ordinary messages and 1s. 10d. per word for press messages was agreed to, the colonies contributing to the subsidy undertaking to make good half the loss which the company would sustain by this reduction in the schedule of charges, and New South Wales, Victoria, Western Australia, Tasmania, and New Zealand at the same time agreeing to pay to South Australia a proportion of the loss to the revenue of that colony which the lower charges would cause in the working of the overland wires. The amended tariff came into force in May, 1891, and the amount to be guaranteed to the company for the portion of the year during which the contract was in existence was £158,491. The sum earned by the company for the same period was £120,141, so that the deficiency on the eight months' business was £38,350, one-half of which was made good by the contributing colonies according to population. But this sum, combined with the amount of the subsidy, was more than the colonies were prepared to bear, and on the 1st January, 1893, the rates were again slightly raised, and stand now at 4s. 9d. per word from Sydney to London for ordinary messages. Even at these charges there was a slight loss to be borne, but this gradually diminished until for the year ending April, 1895, there was nothing to pay under the guarantee. During 1893 the cable rates to New Zealand were reduced from 6s. to 2s. 6d. for 10 words, ordinary messages, the company undertaking to bear one-third of the loss in revenue, New Zealand one-third, and the other colonies, with the exception of Queensland, one-third. The desirability of constructing a Pacific cable, which shall touch only British territory on its way from Australia to America, is acknowledged by the Governments of all the Australasian colonies as well as by those of the United Kingdom and Canada, and it is proposed to appoint a Commission, to consist of two representatives of Great Britain, two of Canada, and two of Australasia, to decide upon the best route to be taken, the probable cost of construction of the line, and the basis upon which the three countries shall contribute. In response to a call for tenders by the Colonial Conference, which sat in Ottawa in 1894, a company offered to lay the cable and maintain it for the space of three years for the sum of 1½ millions sterling. The completion of such a work would have the effect of largely reducing the cable rates to America and Europe, besides being of immense service in the event of an outbreak of war.